One of the biggest challenges for teachers moving online is finding the time to get things moving. Shayna, from Espresso English, shares how she built an online business while working in other positions in this latest interview. 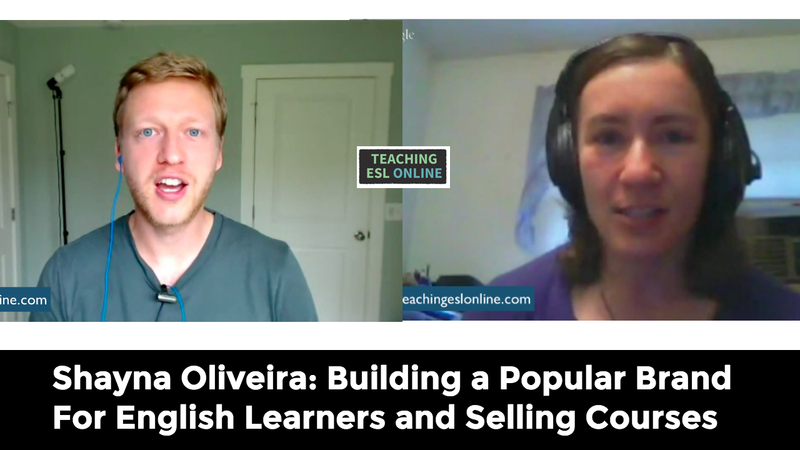 In addition to sharing how she made the transition into going full-time with her business, I ask Shayna about how she built her brand into one of the most popular sites for English learners, what products she sells, how she markets her courses, and her plans for the future. Shayna started her website after one of her learners asked if she could send daily lessons by email. She soon realized that she could reach a lot more people this way and published the lessons on her new website. The first stage of her online business lasted around 6 months. She posted consistently (nearly every day) taking inspiration from her offline classes. She then launched her first ebook “100 Common Errors in English”, and the feedback and sales from this encouraged her to keep moving forward. While Shayna was building her brand, she was teaching in her local area and working 10+ hours per week for a web development client in the U.S. She waited for the right time to go full-time with her business, and her offline teaching was the first to go. After “chickening out” once, she quit her other job in 2014. As of today, Espresso English offers 3 books, 9 online courses, and a monthly subscription program. There are 40,000 learners subscribed to her email newsletter and her site brings in 300,000 visitors a month. Shayna puts her growth down to consistently giving away free content. In addition to her blog, she also posts videos on YouTube and has a popular podcast. Shayna plans to go back and improve the courses she currently has. This will be based on the feedback she receives from those inside her courses. I really enjoyed interviewing Shayna and I have learned a lot from her during out mastermind meetings. Her transition into online teaching is a perfect example of someone building something on the side and going full-time when the time is right. Additionally, the way she has consistently posted free content shows just how far you can take things if you stick at it. I hope you enjoyed the interview. Please leave any comments or questions you have below! You can connect with Shayna through the contact form on the Espresso English website. 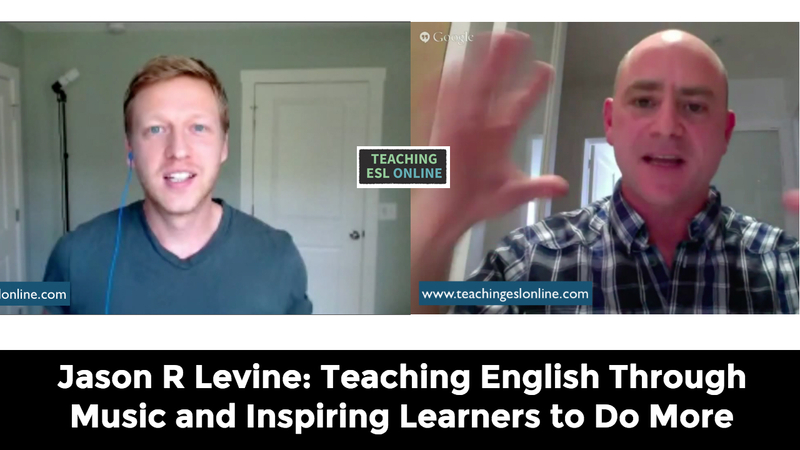 Jason R. Levine is an English teacher who travels the world performing songs he has written specifically for English learners. In the interview, we talk about how he got started with making music, why he was nervous about putting his songs out there, what he likes most about doing workshops around the world, and how he uses social media to connect with and inspire English learners worldwide. 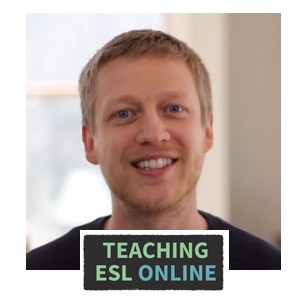 After getting a masters in TESOL, Jase started teaching English in New York. He started using music in the classroom right from the start to give learners more exposure to the language in a way that was fun and sustainable. His first song, StickStuckStuck, has nearly three million views on YouTube. He talked about how he was a little nervous about putting this out there at first, but his learners persuaded him to do it. He didn’t have a plan for where he wanted things to go, but this song was the catalyst for his current success. His first tour came about after a teacher in Morocco shared his video on Facebook. She pulled some strings and he headed over there to perform. At this time, he also realized how powerful social media could be. He started using it as a way to get feedback from learners and teachers. We talked about how different online platforms have allowed him to expand his reach and help him inspire learners to do more in English. It addition to the touring (Gallery Languages help with this), Jase has started creatings courses for learners and teachers. Here is a mini-course that he is going to teach in late June/early July. It is obvious from the interview that Jason is passionate about reaching English learners on a large scale. His work with teachers is incredibly inspiring too. If you follow Jase on social media, you’ll realize that he enjoys sharing, commenting, collaborating, and working with other teachers. He is incredibly active and his success online is down to the work he puts in. I would love to hear what you think about this interview, so please leave any comments you have below! Follow Jason on Facebook here. 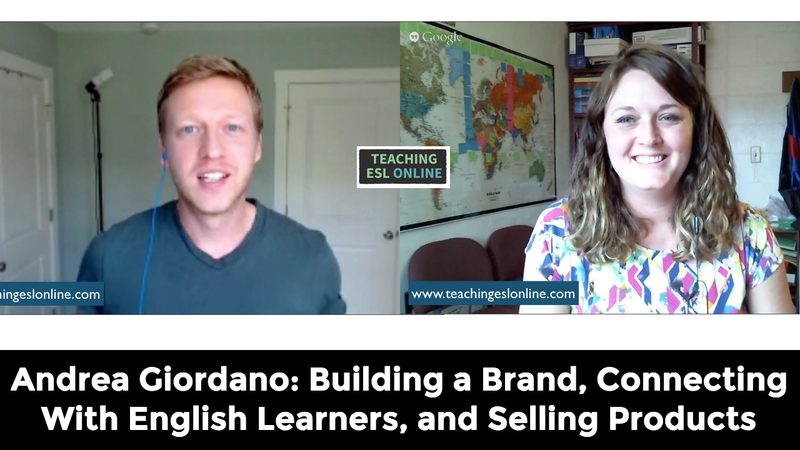 Joining Teaching ESL Online in this latest interview is Andrea Giordano from ESL Basics. Andrea and I recently collaborated on a video together and, after looking at her website and YouTube channel, I reached out to ask if she would like to share her online teaching story with us. In the interview, we discuss how she got started, email marketing and social media, and her courses for English learners. Andrea started teaching English in 2006 while she was in the process of getting her TESOL. But after binge watching Food Network Star, she thought, “I can do this.” So, after bouncing ideas around with her brother, she decided to start teaching English through video. She shot several hundred videos on her YouTube channel in the first couple of years and has continued uploading free content since then. Her biggest challenge in the beginning was working out who her audience was and how she was going to connect with them. Most of her early videos were around 15-20 seconds long. As she became more comfortable and built up her experience teaching in the classroom, she started to make longer-form videos. She regrets not starting an email list straight away but, when they did, it was a game-changer, and this is when they started to see their audience grow. They have had ups and downs with YouTube – having your advertising cut off is never nice! – but it has helped them cast a wide net and bring more learners into their world. Andrea interacts with learners through her various channels. She talked about how she reaches out to people through Twitter, not to sell them her courses, but to get the conversation going. As she mentioned, she really cares about helping learners improve their English. They use Selz as their payment provider for their products. We both talked about how easy it is to set up and use, and Andrea mentioned how impressed she was with their customer service. They have had much success with helping learners who need to take the Citizenship Test in the U.S. and have various products and videos in this area. 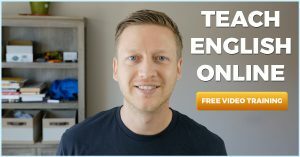 A new course (The Spoken Life) is going to be introduced soon (by the time you read this, it will most likely be live) and it is there to help English learners become more confident with their speaking. You can reach out to Andrea by email or by contacting her through Twitter. I hope you enjoyed listening to Andrea’s story. Unfortunately, I messed up the recording of the video a little but we got to see her at the end! One of the biggest takeaways for me was the amount of time she spends interacting with people online. Doing this shows that you care and helps you build trust with English learners. Please let me know your thoughts on the interview in the comment section below! I often get emails from teachers worried that online tools and resources are going to replace them. My opinion is that this won’t happen anytime soon. Additionally, we shouldn’t see these resources as competition but, instead, as potentially useful tools to help us better help our learners. And in this post, I want to look at three resources that you can use to improve your pronunciation lessons. I will focus on how I use them to help my students with English sounds but, as I mention later, they can be used for all areas of speaking. Firstly, I want to go into how I approach this area of English as this will give you an insight into why these tools are so useful. One of the biggest problems English learners have is being able to pronounce sounds correctly. One reason for this is that there are 14-21 vowel phonemes in English (depending on the variant), many of them not present in other languages. Therefore, learners will default to sounds in their own language if they can’t produce it correctly. Online tools make this much easier and allow you to work asynchronously with your learner. Let’s look at step one of this process and the relevant tool. This handy app has an animation of what happens inside the mouth when different sounds are made. This, along with any explanation, allows your learner to see what’s going on inside the mouth so that they can then experiment with their tongue, lips etc. to mimic the speaker. I’ve found that this comes more naturally for certain students but, with enough practice, everyone will finally get there. Outside of class, encourage your learners to play around with this app. If they struggle with certain sounds, then suggest that they start with those. In addition to the visual representation, there is also a video showing a real person saying the relevant sound. This made all the difference for my Spanish-speaking student and his ability to correctly say the ‘w’ sound. I told him to watch the video, repeat after the speaker while looking in a mirror, and then to compare the two, and this solved the problem for him. Let’s move on to stage two. In order for your learner to get this right over the long-term, they are going to need practice. I prefer to make drills relevant to each student and, when I’m teaching one-to-one, I send over personalized audio based on the lesson/conversation we’ve just had. This isn’t difficult to do. You just need 5-10 minutes, Audacity (or any sound recording app), and a file sharing application. To record the relevant drills, I go through my lesson notes and record sentences. I ensure that the sounds that we have been working on are included in these sentences, and will also add some specific pronunciation drills where needed. Once I have recorded those sentences, I simply drag them into the relevant folder on my computer. This is linked to the DropBox folder that I share with my learner. The student then downloads the audio and – in theory, at least! – repeats each sentence out loud during the week. This builds muscle memory inside the mouth. If you create sentences, this not only helps learners with English sounds, but also with the different areas of pronunciation like stress, rhythm, intonation, and so on. I also send learners to the drills over at the Mimic Method website where there are some really useful comparisons. There are two ways to give feedback: live in class or asynchronously. I’m going to focus on the latter here. I’ve used a variety of different tools to give feedback asynchronously. SoundCloud is my first choice as you can leave comments at specific points during the audio. In addition to pronunciation, I’ve used it to give feedback on IELTS speaking questions and on presentations. Another option is to use Google Drive and the Kaizena app or to have the audio sent to your DropBox using the DBinbox application. Working asynchronously has a couple of benefits: firstly, it allows you to be more flexible with your schedule and, secondly, you can take your time with the feedback and listen more closely. In addition to teaching sounds, I also use this method and the relevant tools to help my learners with connected speech, intonation, rhythm, stress, other parts of pronunciation, and speaking in general. I have used this both in one-to-one lessons, group lessons, and in my online courses. 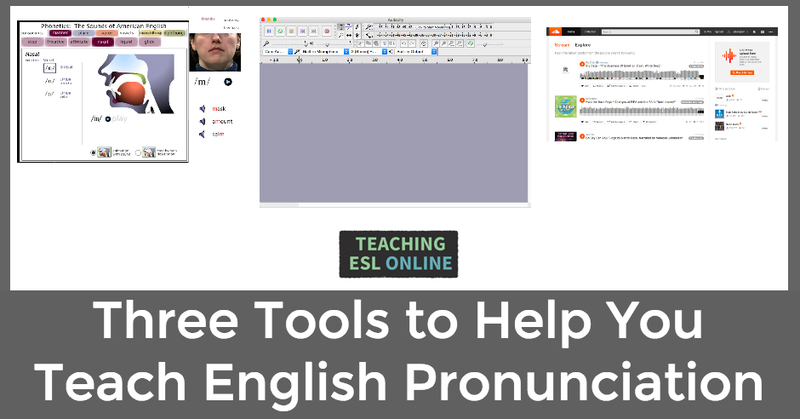 If you have used other tools to help your learners with their pronunciation, please share them below. Thanks for reading!